Big Bag Lifting frame. Manufactured to the highest standards in the UK. Available as 1 t or 2 t SWL in a choice of sizes to suit most applications. Bespoke designs available upon request. Our Big Bag Lifting Frame is designed especially for the safe and easy movement of sacks, or similar heavy loads, with a capacity of up to 2000kg. By hooping the bags through all of the welded lifting hooks, you can lift and move the load with minimal hassle and with a positive closed connection. All our weld on hooks are fitted with safety catches as standard. We also offer non standard bespoke design big bag lifting frames with a cranked up arm configuration to increase headroom dimensions in tight clearance situations. The Big Bag Lifting Frame from Hoist and Winch can be fitted to forklifts fitted with a swivel hook, or even overhead cranes, electric or air powered hoists or other suitable lifting devices. 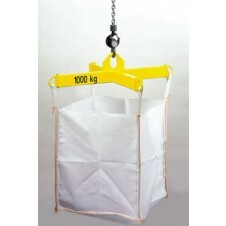 Shop our range of big bag lifting frames online now.